Reports from several sources have proved that the economy of Canada must seem to be growing, but sadly, Shortage of skilled labor acting a severe threat to the economy of Canada as the Skilled labor number is declining hence the productivity of the work is falling. As the Graduates need the primary Aptitude- Ontario's Quality Council of Higher Education has recognized that the graduates of Ontario need basic reading and mathematics knowledge and aptitude which is necessary to get a good job and continue a successful career. Shortage of labor is a 40% story of Canada not only in the province Ontario. What is further troubling is that one cannot neglect the fact that if an employee lacks the basic aptitude, he will not do any great for the company and will not be capable of thinking of any current and brilliant ideas. Furthermore, he won’t be capable of keeping pace with the developments in present technology and improvements. Attaching to the chaos is Morneau's Bill (Canadian finance minister) modern idea of placing specific emphasis on skills training for the forthcoming budget of the year 2019. Skill training might be an accurate step because of the failure to write and read should not be a problem of fall for any economy. 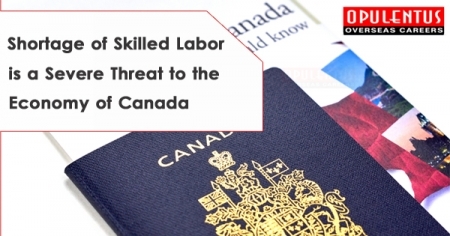 Shortage of skilled labor acting a severe warning to the economy of Canada requires to improve the Canadian educational skills so that the regional student is further effective and satisfy the fundamental requirements of any infrastructure of the business. The government of Canada also recognizes this and is working hard to decrease the hurdles and gaps to continue productive and at par with other global economies.